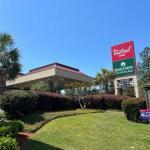 Complimentary breakfast free Wi-Fi an outdoor pool and free parking score with our guests at the Red Roof Inn Augusta - Washington Road. This two-story hotel houses 145 rooms offering signature beds coffee makers clock/radios large work desks free Wi-Fi and cable TVs with premium channels and pay movies. Select accommodations have microwaves sofa beds and mini-fridges and non-smoking rooms are available. The hotel also has an outdoor pool fitness center and a business center and offers laundry/valet service. In the morning enjoy a free hot breakfast or pick up a grab on-the-run breakfast bag on weekday mornings if you're in a hurry. Parking is free. The hotel is on I-20 two miles from Augusta National Golf Club and four miles from Augusta State University. Augusta Mall and Sacred Heart Cultural Center are within five miles and Augusta Regional Airport is 15 miles away.